While we will get into the great BBQ debate, Wood vs. Charcoal vs. Gas sometime in the future, there are two things you must utilize if you are going with the combustible compressed gasses – ceramic briquettes and a smoker box. Many will tell you that you can’t get real BBQ flavor if you opt for a gas grill. But, if you add these two elements to your grill, you’ll be hard pressed to taste a significant difference from the more traditional Caveman type of cooking. Ceramic briquettes are made by numerous manufacturers and have a variety of shapes. I don’t necessarily have a favorite but GrillPro and Ducane both make a quality product at a decent price. Just be sure to space them out evenly and so that there is a little bit of space between them. They will serve to dissipate the heat evenly, reduce flare-ups and, as they season, provide added BBQ flavor. A smoker box is basically a metal box, usually made of cast iron, with a lid – both with plenty of holes to allow the savory smoke from wood chips envelop your food. Again, there are many on the market. Some costing as much as $50! But, for around $10, you can get one similar to what is pictured here, sufficient for most grilling situations. It is very important, though, to make sure to get one that fits comfortably in your BBQ. You don’t want the box taking up too much of your grilling area. 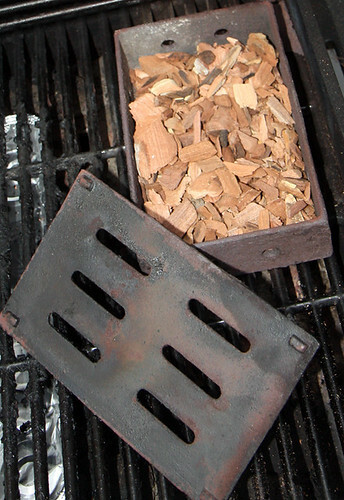 Just fill the box about halfway with your favorite kind of wood chips, put the lid on, and place directly on the grill. Be sure to experiment with the various types as oak, cherry, mesquite, hickory, etc. all give differing nuances to what you are cooking. Many will tell you to soak your chips in water first … and, when using direct flame on your chips, that is good advice. But, when using a smoker box on a gas grill, I suggest you keep them dry. If wet, they just take too long to get smoking, and your meal doesn’t get much of the smoking effect. Plus, even when dry, I can often get two or even three different meals cooked on one load of chips when using the box. Add these two tools to your grilling machine and you will be amazed at how much flavor you can get from a gas grill. Enjoy! Of course! You can reach me at CAVEMANCOOKING at CA dot RR dot COM. i still prefer gas grills over electric grills because the smoke somehow improves the flavor of the meat~’. Couldn’t agree more as far as grills go, BW. Though, electric smokers work just fine in my book.